A new spin on the old-fashioned guest book, the Personalized Wedding Wishes Signature Frame puts their good wishes where you can see them. 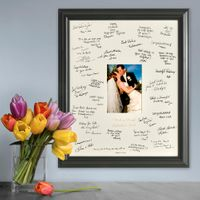 Guests add their signatures and sentiments to the photo mat and couples insert their favorite wedding photo for a memorable tribute to that special day. Engraved Option includes brushed Silver plate is personalized with bride and groom's names and wedding date. Plate not attached to allow for vertical or horizontal placement. Personalize plate with 2 lines up to 20 characters per line. Laser Etched option includes Bride and Groom's names and wedding date laser etched into the photo mat. It can be personalized with 3 lines up to 20 characters per line. This option only available in vertical orientation.